Update: Draw Something 2 is now available in the Apple App Store in two different versions: a free, ad-supported one or a $2.99 premium app. During Zynga’s Q1 2013 earnings conference call, company CEO Mark Pincus announced that the sequel to Draw Something will launch later today in the United States. This interesting news comes as the company announced that it shuttered two “non-franchise” games this quarter and plans on ending four more in Q2 2013. 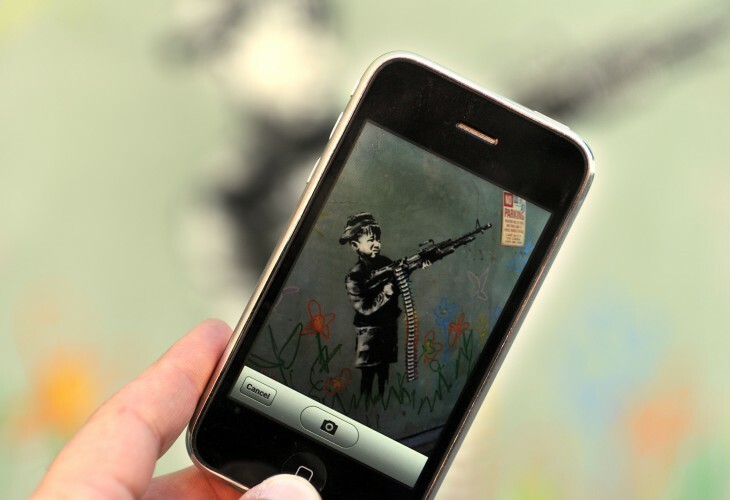 With respect to Draw Something 2, Pincus said that the sequel to one of the top games of 2012 will be available today. This is the first release since Zynga acquired the game’s creator OMGPOP. It functions similarly to “Pictionary” where it asks players to draw images based on selected words and asking their opponents and friends to guess what it is. As the Wall Street Journal reported earlier this year, Draw Something 2 will now allow player to save their work — unlike the first version where drawings were submitted before being removed. Sure, later versions allowed for posting to Twitter and Facebook or even downloading them to the device, but now it will hopefully make it available across whatever devices a player is using. 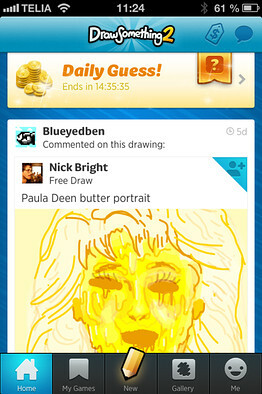 Zynga says that so far, people appear to be interested in Draw Something 2 and has a “huge potential to grow”. It cites a Tweet sent by celebrity Ryan Seacrest which resulted in 40 million Twitter impressions within a day. Prior to today, the game was only available in Canada, but early results show that it’s one of the top 5 free apps in the market. But while Zynga is hoping that Draw Something 2 will help turn its company around, its strategy doesn’t come without a cost. Also announced during the earnings call were the closures of a few games. In Q1 2013, Pincus shared that it killed two non-franchise games. Although those games would provide short-term benefits to the company, it would have also been “short-lived” — Zynga needs something that will drive “long-term enterprise values” in order to help turn the social gaming company around and drive more revenue and in-app purchases. In Q2 2013, the company also announced that it will be closing four more games, including The Ville, Empires & Allies, Dream Zoo, and Zynga City on Tencent. Pincus has called 2013 a “transitionary year” and has cautioned that investors should expect “uneven, non-linear results.” But as the company seeks to find ways to revitalize itself, being able to cut out some of the games that won’t provide any long-term benefits is probably a wise move. 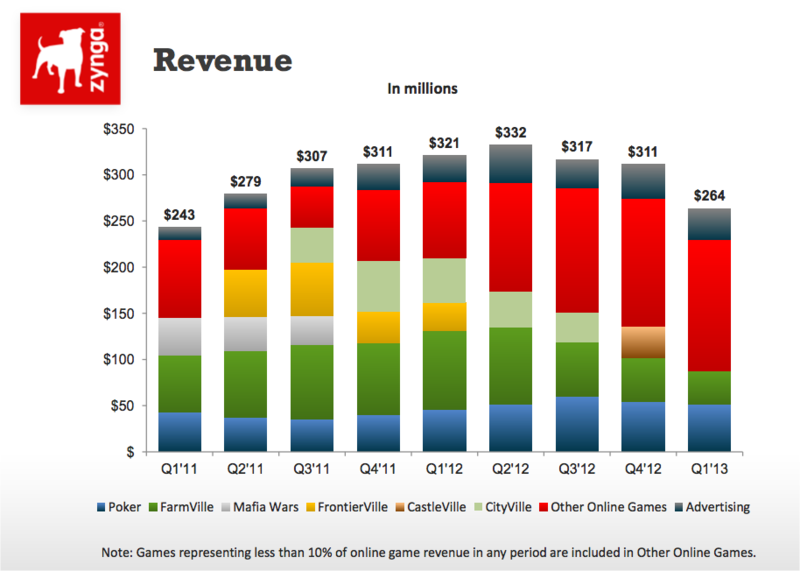 In looking at its revenue graph taken from its Q1 2013 earnings slide deck, much of this quarter’s revenue comes from other online games. These games are not popular titles like Zynga Poker, FarmVille, Mafia Wars, FrontierVille, CastleVille, and CityVille. Rather, they’re games that represent less than 10 percent of online game revenue. Zynga could be hoping that the shuttering of these non-franchise games will help trim costs, giving it more resources to apply to other games like Draw Something 2. Additionally, it could be all part of its plan to transition itself from just being a Web game to something more mobile, which Zynga admits it’s not quite there yet, but it has seen some success. One need only look at its mid-core game War of the Fallen — the company says that the monetization rate for that game is 15 times higher than with its With Friends franchise.